If you are looking for ways to reduce sugary drinks in your diet, you might want to first take a look at the beverages you consume. Juice, soda, specialty coffees and energy drinks can be loaded with sugar, fat and calories. Studies show we also tend to be less satisfied with calories consumed through beverages than food. 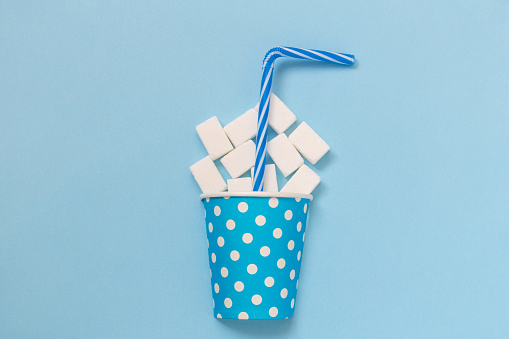 Here are 3 strategies to reduce sugary drinks in your diet. In order to really understand what you are consuming, read nutrition labels. Nutrition information for restaurants is widely available online and in stores. Unless you only drink water, seltzer, black coffee or tea, reading labels will help you to understand how what you drink contributes to your diet. Start by replacing one or two sodas or juices a day with plain water. You can keep your coffee, however; try swapping out a sugary latte for plain black coffee with a splash of low-fat milk or non-dairy alternative. Switching from tasty beverages to plain water can seem boring at first. If you do not look forward to drinking just water, try adding fresh lemon, lime or cucumber slices to your water. Sugar free seltzer is another great option. Try making your own juices and smoothies. You will know exactly what you put into them, and avoid sneaky added sugars often found in more highly processed juices and smoothies. Cutting back on sugary drinks might seem difficult at first, but this is an easy change with lot of health benefits. KareBoost Health is here to support you on your journey towards wellness. Contact us to see how our health coaching can help you, and to set up your free consultation with Dr. Karen!